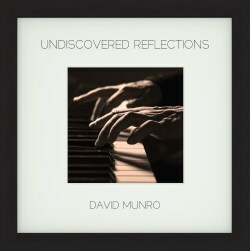 David Munro is a pianist and composer who has written extensively for dance, opera and theatre as well as orchestral arranging. This is his first self-composed disc, a solo piano album of narratives, images and reflections that form compact pieces with memorable titles. In the booklet he introduces each of these descriptive titles with some succinct words that sum up their inspiration or essence. Take Intermezzo, one of the most musically ‘correct’ titles, and one which is dedicated to the composer’s mother. It is a kind of reverie but with a decidedly tempestuous B section, leading to a refined and affectionate conclusion; an apposite portrait, one assumes. The gently capricious Awaken to Dreaming moves through motifs and keys in a dreamlike state of consciousness or unconsciousness, and takes in a decidedly perky up-tempo dance. In The Abandoned Palace he draws on Pati Makowska’s photographs of Eastern European palaces to draw a portrait of ruined glory echoing to the romantic heroism of an Imperial past. His ripe chording offers its own ghostly music. Munro suggests that The Dirty Little Rag is a cheeky romp with ‘crunchy harmonies’; true enough, its acidic moments stop it ever becoming becalmed or run-of-the-mill. Nice title too, with hints of Jimmy Cagney. Nostalgia is filmic and attractive before a rather explosive flourish of a coda, but Getting Out of Life is a more complex narrative dealing with, as its title laconically puts it, the nature of dying. Its heartbeat slackens to rippling states of consciousness in two minutes flat. I liked the warm burnished opening of Sunflower and Not A Care in the World is precisely that – an insouciant crisp closer with hints of a Russian dance. The central piece, however, is Aspects (Harmonic Variations) the only larger-scaled piece here, a theme and nine variations, all separately tracked. Munro uses chords not melody as the basis for his variations and they are all as concretely personalised as his other words. Thus, there’s a touch of Einaudi about the first variation, an off-kilter Rag feel – only more worrying – to the second, a terse and abrupt sixth variation (which Munro titles ‘Rude Man’) and an energising powerhouse finale. Munro has a talent for succinct characterisation and that’s abundantly clear throughout this 48-minute disc. It’s also fun and full of good, communicative things.